Designed by Jasper Morrison, the Basel chair is an interpretation of the classic wooden chair. Known for approaching each item with a practical and simple style, Jasper Morrison’s designs do not attempt dramatics or over-styled forms and rather present a refined version of multi function, everyday-use furniture items. The Basel wood chair is no different; classic in form, but an updated modern variation for multiple interiors. 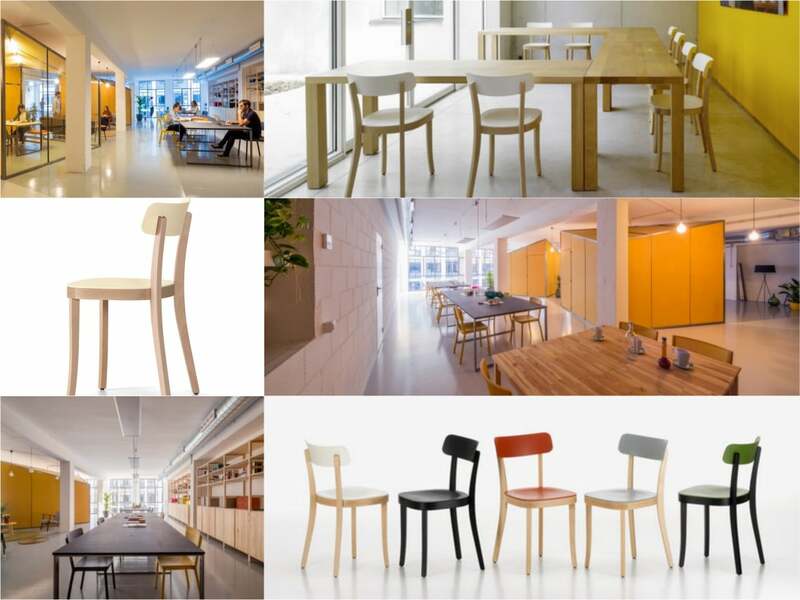 Here, we present inspirational ideas for applying the Basel wood chair. Characterised by floor to ceiling height windows, hints of an urban industrial past and a modern refurbished interior, this refurbished space presents a casual yet sophisticated workplace. To create separate areas of function within the large open space, plywood slabs have been inserted alongside glass walls and doors. Alongside meeting rooms and private working spaces, these enclosed spaces are surrounded by more playful, casual communal areas. The central zone features a range of free standing workstations complemented with wooden chairs. These allow the space to be used as an informal meeting area, breakout space, or for recreational functions. It will seem at first glance that the Basel chair is composed entirely of wood however, further to allow comfort, the back rest and seat are composed of plastic. This enhances comfort making it ideal for casual working environments, akin to the Zamness office space. Ideal for meetings or as a canteen chair, the neat lines and simple form makes it adaptable for use all around an office space. Situated within a building previously home to a newspaper publishers from the 1930’s, the Backstay Hostel has retained many of its original features with some subtle enhancements. Vintage and antique pieces adorn various spaces, ranging from typewriters to a piano and guitars, with bright playful colour tones to create an attractive and inviting space. The main space on the ground floor has been redesigned to allow non-staying visitors to enjoy the space and the retro feel that has been conserved. 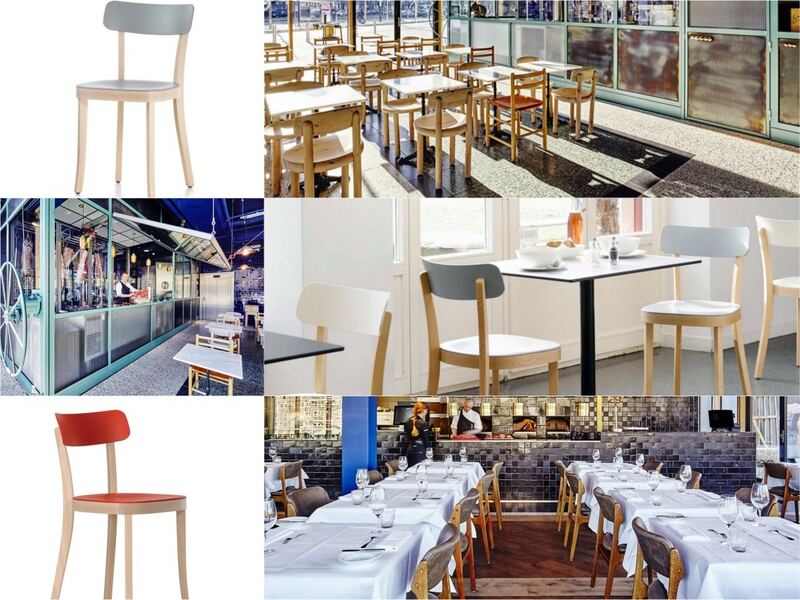 To create an attractive space for use within a hotel interior, the Basel chair also comes with a selection of wood colour options and seat and backrest colour choices. Choose from a beech or black stained frame and six seat colours from cream, brick dark green and more. Preview hanging meats in the large windows of this meat-based eatery. Offering two definitive spaces; on the ground floor an informal food space whilst the upstairs a more formal dining experience, the Roast Room shows how classic wooden chairs can be used to create two very different atmospheres. The space within the ground floor restaurant is fashioned with classical wooden chairs. Upstairs, a more comfortable variation of the wooden chair is used adding to a more comfortable and sophisticated space. 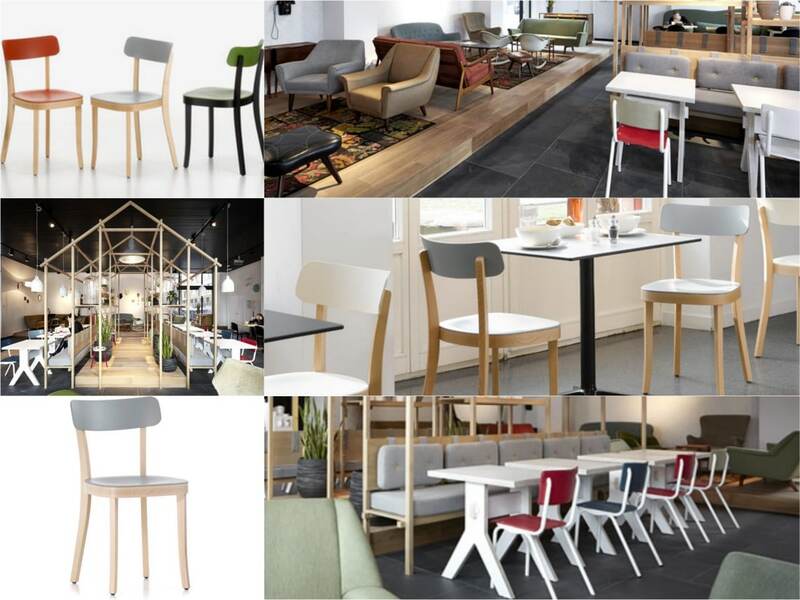 A form that is both aesthetically pleasing and designed for enhanced comfort, the Basel chair can be used within a variety of dining interiors. It is clean, yet highly robust with its solid wood frame. 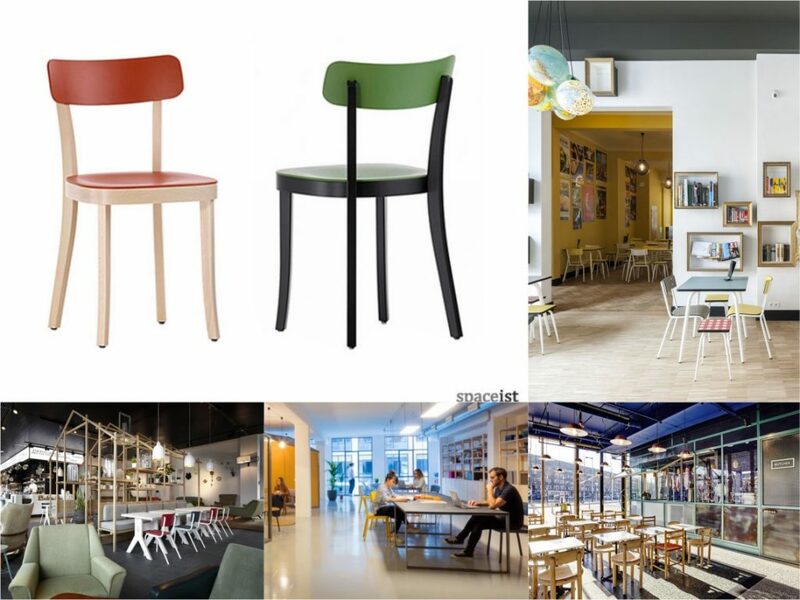 The warm colours of the seat and backrest allow it to be used in spaces that require more stylised commercial interiors, yet the lightweight properties means it can also be used within flexible spaces. Bar Marie is the café space for the headquarters of Marie Claire magazine and has been designed to offer room for very creative, relaxed and also client based meeting spaces. A selection of soft-furnished loungers and comfortable sofa’s create the informal sitting areas, with more formal seating spaces with tables ling the central spaces. 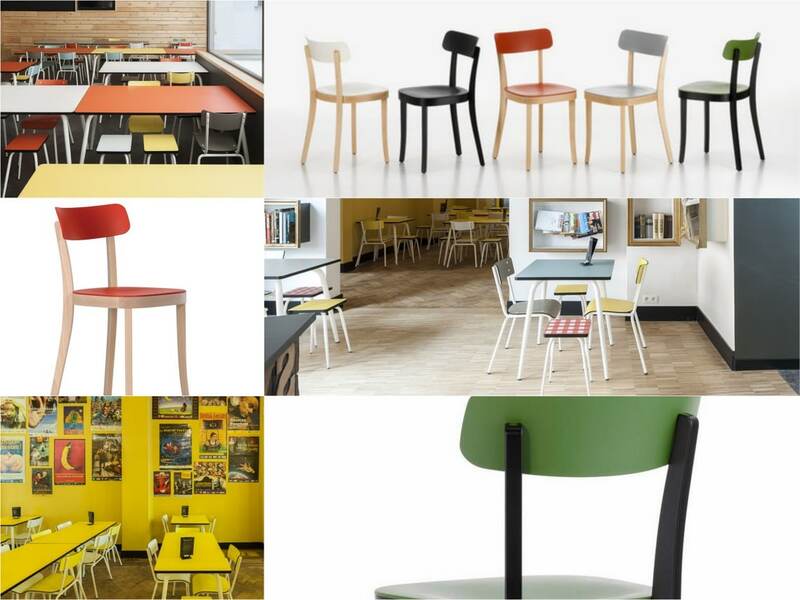 These are furnished with colourful wooden chairs and bench seating on the opposite side. This allows a variety of functions to play out within this expansive café space, within both relaxed and professional interior surroundings. The key characteristic of the Basel chair is the nature of Jasper Morrison’s design; refining a classic chair with simple enhancements. The legs of the Basel are slightly curved further increasing support, making it suitable for use within high volume spaces. A simple addition, it adds to the aesthetic form of the chair making it an ideal complement for placing alongside other furniture options.